Riding a five-year trend of high absorption levels, developers planned another robust year of new construction in Brickell’s hot condo market. But early signs suggest 2016 might be different. The market took delivery of well over 1,000 units in 2015, and about three times that many sit on the drawing board for the next two years, according to ISG World’s Market Report for Fall 2015, a comprehensive overview from International Sales Group, known as ISG. While seasoned realtors say they are bullish about the potential for absorption, some predict that prices will probably go through a period of adjustment as inventory rises. But some say that prices could remain flat as the flow of inventory slows in response to changes in South America’s political landscape. 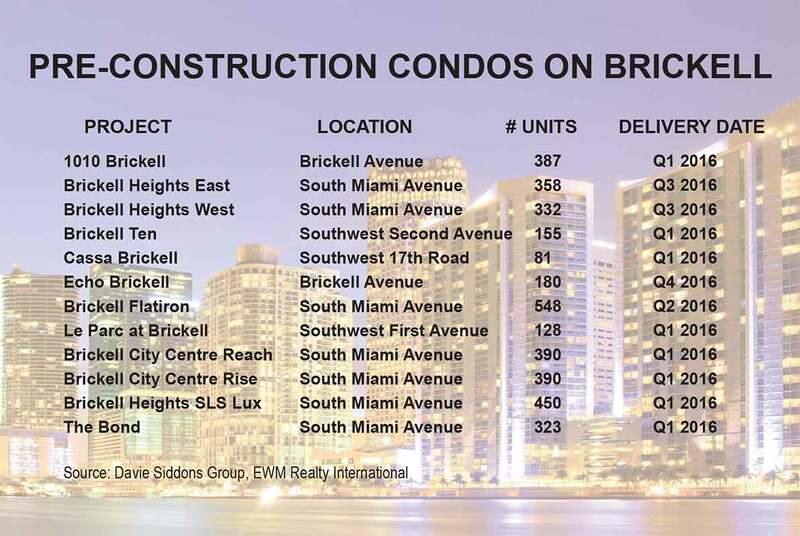 According to the 2015 Owner’s Guide to Brickell & Downtown Real Estate recently released by the David Siddons Group at EWM Realty International’s Brickell office, new preconstruction projects raised Brickell’s condo inventory by 36% in 2015. That resulted in a 14- to 22- month increase in supply, the report states. A nine-month supply is considered a balanced market. Nevertheless, research showed property prices increased in 2015 by an average of 2% to 8%. At the same time, rental prices climbed 6%. In such an unbalanced market, EWM’s David Siddons said, continued price escalation is not in the cards. Mr. Siddons estimates the market will absorb the inventory in about three years. The coming year, however, might look somewhat different from earlier projections. ISG principal Craig Studnicky said that while prices aren’t likely to rise, he doesn’t see them dropping much either. ISG World reports that of the 5,513 new units available for sale since mid-2011, 4,676 have sold. That’s an average absorption of 625 units a year over the past five years. And although more than 2,300 units in eight projects are slated for delivery in the first quarter of 2016, “don’t expect them all to come online so fast,” Mr. Studnicky said. Several projects touted as planned or proposed a year ago – 1201 Brickell Bay Drive, Residences at Brickell Key, Habitat III and Brickell Flatiron II – seem to have disappeared from the dialogue, at least for now. Edge on Brickell has been cancelled, Mr. Studnicky said, though 1201 Brickell might resurface early next year. The slowdown, he said, is not a cause for alarm. In this cycle, developers have followed the conservative South American model for pre-sales, requiring a down payment of about 50% from buyers before closing. Political trends in South America may help close the gap between the dollar and other currencies, Mr. Studnicky said. Venezuela just elected a centrist legislature, and the nation’s socialist president could be stymied by them. Argentina, in its first popular ballot, just elected the country’s first non-Peronist president in many years, while Brazil’s president is under attack from opposition parties seeking her impeachment. The attraction of Miami for South Americans, he said, remains as strong as ever. If Brickell Flatiron has not even started construction how can it be ready in the 2nd Q of 2016 per the image you are posting in this article?